Pure, pharmaceutical grade sea salt containing all trace elements found in natural seawater. From (osmosis-) water to seawater. Tropic Marin Sea Salt 4kg is made up of all of the macro elements and trace elements in a natural balance, contained within the ocean, and it is free from artificial additives, nitrates and phosphates. The trace elements remain completely soluble in the mixed crystals. Contains appropriate amounts of carbonates and bromates which stabilize the aquariums alkalinity and pH. 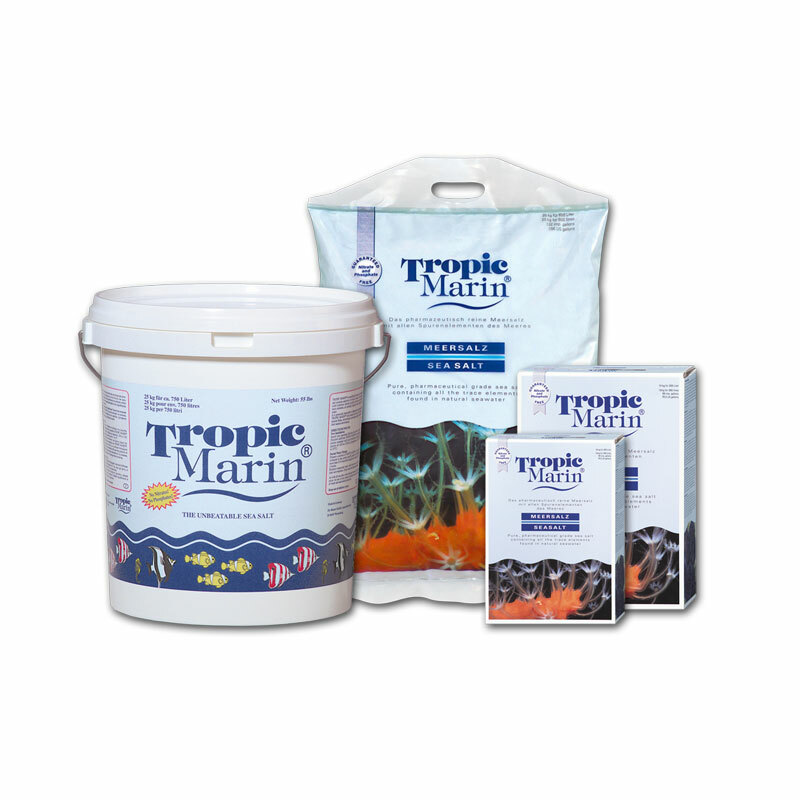 Tropic Marin Sea Salt 4kg is an ideal foundation for the care and growth of all marine organisms in an aquarium. Use seawater prepared with Tropic Marin Sea Salt 4kg for regular water changes in your seawater aquarium, to start a new aquarium and to re-equilibrate the pH of a tank. Contains all 70 trace elements found in natural seawater, in the exact proportions found in nature. The 70 trace elements are completely soluble due to the use of the mixed-crystal method. Compliance with the most stringent quality control measures for the production of pharmaceuticals ensures completely natural sea salt. Provides the ideal environment for the care of all marine organisms in the aquarium, including even the most sensitive species. For fish only tanks and reef tanks with soft corals with no special requirements. To maintain the alkalinity in a 9-10° dKH range. Used successfully for many years in zoos & public aquariums. To achieve a salinity level of 32-35 ‰ (psu), dissolve 35 ml of Tropic Marin Sea Salt per litre or approximately ½ cup of Tropic Marin Sea Salt per US gallon water. Dissolve almost all of the salt in a clean container already filled with the full volume of RO/DI water at a temperature of 73-77°F / 23-25°C while circulating/stirring the water. Do not concentrate the mixture by adding the full amount of salt to a smaller amount of water. When you have added ALMOST all of the salt and the mixture is fully dissolved and clear, start measuring the specific gravity with a hydrometer or similar instrument. Keep adding small amounts of salt until the specific gravity is the value you desire. The specific gravity of the sea salt solution should range from 1.025 to 1.027 (at 73-77°F / 23-25°C) and the pH -value should be in the range of 8.0 – 8.4. If all parameters ​​are correct, the salt water is ready to use. A weekly, partial water change, replacing 10-20 % of the total water volume with Tropic Marin® Sea Salt, will help to maintain the water quality that your livestock needs for good health. Application: For fish only tanks and reef tanks with soft corals with no special requirements. To maintain the alkalinity in a 9-10° dKH range.